Lynn Good, CEO of Duke Energy, speaks at the Hood Hargett luncheon on Wednesday at the Palm Restaurant. 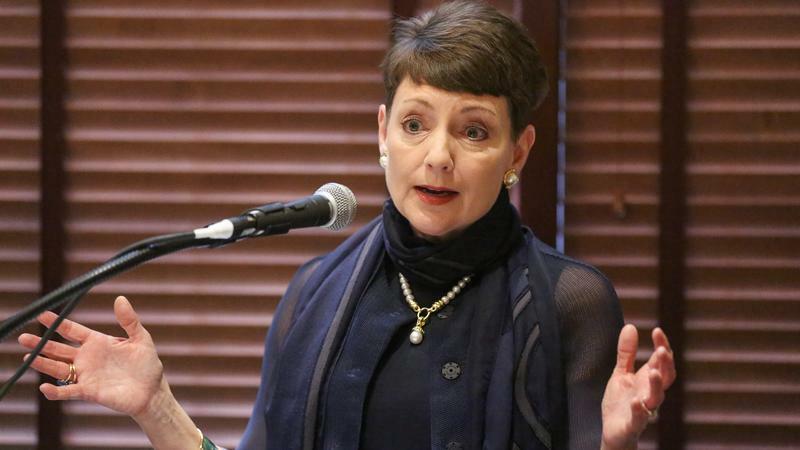 Duke Energy CEO Lynn Good says despite talk of “reviving the coal industry” in the Trump administration, coal remains economically and environmentally challenged — and Duke won’t change its move away from the fuel. The future of coal was one of more than a dozen audience questions Good addressed as the luncheon’s featured speaker. She last addressed the group three years ago. She also addressed the future of new nuclear plant construction at Duke (NYSE:DUK), making that sound only a little more likely than development of a new coal plant. And, she made it clear that's not something Duke is looking at short-term. “You may have been reading about something called the Westinghouse bankruptcy,” she told the audience, referring to Westinghouse Electric Co.’s March 29 filing for Chapter 11 protection from creditors. That filing came after Westinghouse lost more than $6.2 billion as the principal contractor for the only two new-generation U.S. nuclear projects in the United States. She said that Duke’s proposed Lee Nuclear Station is supposed to employ the Westinghouse AP1000 nuclear reactor that has been the subject of construction delays and significant cost overruns at SCANA Corp.’s V.C. Summer Nuclear Station in Jenkinsville, SC., and Southern Co.’s Plant Vogtle in Waynesboro, Ga.
Duke operates 11 nuclear reactors at six sites across the Carolinas. She called them “some of the most valuable assets in the region,” and says the company is inclined to seek regulatory permission to operate them for 20 years beyond their current 60-year licensing limit. Good took questions for about 40 minutes after a brief speech to the group. In those opening remarks Good focused factors driving transformation at Duke. She spoke about the Duke’s evolving relationship with customers, and its efforts to be more responsive and to make more information available to the people and businesses on its grid. She outlined efforts to invest in the power delivery system, including Duke’s plans to spend $13 billion over the next 10 years to upgrade the grid. And she asserted Duke remains committed to providing more clean energy for customers. She said solar has to be an important part of that. But she also counted the move to natural gas from coal as providing cleaner energy and she said the nuclear, which provides 40% of the power in the Carolinas, needs to remain an important part of the energy mix because it provided base load power without carbon emissions. She discussed the recent acquisitions — Progress Energy and Piedmont Natural Gas — and predicted the consolidation in the energy industry would continue. In response to an audience question, she said power remains a fragmented industry when other utility-style business like telecommunications have long since consolidated largely because the states tend to have such a large role in regulating the power industry. The need for state approval on some many mergers makes completing them more difficult, she said. “For every merger that closes, there’s one that doesn’t because they couldn’t get regulatory approval to consolidate,” she said. The telecommunications industry, on the other hand, is regulated largely at the federal level. She said the fragmentation is even greater in the natural gas industry — in which Duke hopes to expand now following the Piedmont purchase.